Can users be your last line of defense? Phishing and ransomware are serious problems that can steal data or disable access to your organization's network. Both ransomware and phishing are increasingly common and are having devastating impacts on businesses of all sizes. The FBI estimates that ransomware alone cost organizations $209 million in just the first three months of 2016! 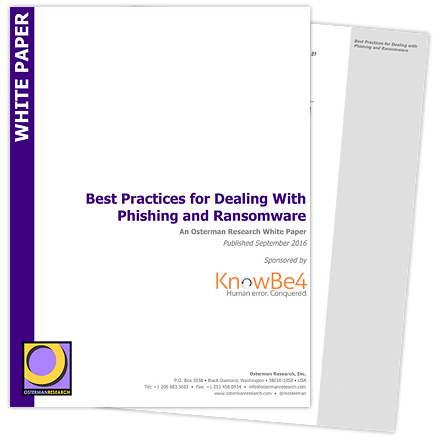 This new Osterman Research whitepaper gives you a variety of best practices that you should follow in order to minimize your potential for becoming a victim of phishing and ransomware. Among these best practices are implementing security awareness training as your last line of defense.